from Commander and Chief ! Today is John McCain's 72nd birthday. If elected, he'd be the oldest president ever inaugurated. And after months of slamming Barack Obama for 'inexperience,' here's who John McCain has chosen to be one heartbeat away from the presidency: a right-wing religious conservative with no foreign policy experience, who until recently was mayor of a town of 9,000 people. In the next few days, many Americans will be wondering what McCain's vice-presidential choice means. Please pass this i nformation along to your friends and family. 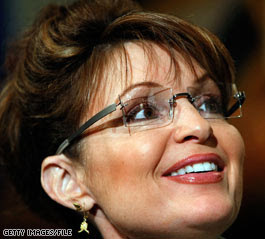 B4B NOTE: It's now being revealed that McCain doesn't even know Palin....actually only met her twice. Is this pathetic or what ? I'm starting to wonder if Mc is losing his mind or just a dirty ol' man !